Got an empty schedule this Saturday and finished all your jigsaw puzzles lying around? Well, now there's something out there that will let you keep puzzling while you wait for a new order in the mail or until you're ready to trek over to the store. The new Ravensburger Puzzle App is $2.99 on the iTunes store. 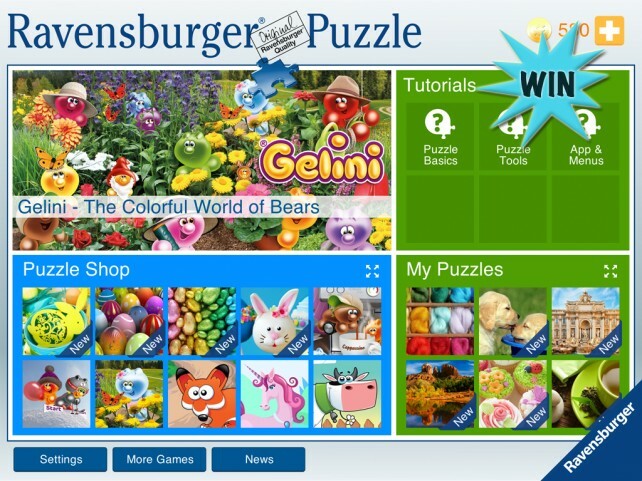 Designed specifically for the iPad, this app lets you do jigsaw puzzles from the comfort of your couch. You won't have to bend over the craft table, worry about the glare on the pieces, or shoo the cat away so he doesn't ruin your hard-sorted puzzle pieces. You can complete this puzzles from anywhere with a WiFi connection--that's great for those people that want to wind down in the coziness of their bed just before going to sleep! With your $2.99 purchase you'll get six puzzles to choose from, three tutorials, relaxing background music, and eight table themes. You'll get to keep track of your achievements and leaderboards via Game Center, and the best part of all--you get the freedom of choosing your piece count! From 20 to 500 pieces, you get to make the choice that's best for you. No longer do you have to eye a puzzle with a great image but wish it came in the right piece count! Now you can make it happen with the click of a button. The in-app puzzling should come naturally to those that love jigsaw puzzles. The pieces will be scattered randomly over the screen, and there will be a drop-bar tray for safekeeping of those pieces you want to save for later (you'll never be able to lose a piece again!). There will be a snap sound alert when you've fit a piece into the correct spot by moving and rotating, and a handy image as a reference that you can place for your convenience. Don't like the six puzzles offered with the initial purchase price or itching to the perfect puzzle for your iPad? The app also comes with a built-in library where you can purchase more puzzles for an additional fee and search by theme or release date. This is the perfect solution for people without a lot of space to do their puzzles or people that just love their iPad!